Windows Phone users hankering for the next preview build of Windows 10 don’t have to wait much longer. That’s because the new build includes a bug that prevents a direct upgrade from the most recent publicly available build of Windows 10 Mobile, according to Gabe Aul, the general manager for Microsoft’s Operating Systems Group Data and Fundamentals team. Once downgraded, they will then have to opt back into receiving Fast ring builds of Windows 10 using the Windows Insider Program app. Starting Tuesday, they’ll be able to download the next version of the update. However, those users who re-install Windows Phone 8.1 Monday morning should hold off on opting back in to the Windows Insider Program, just so they don’t get put back on the build they just uninstalled. The new build will replace build 10080, which was released to members of the Windows Insider Program a month ago. It’s not yet clear what new features will be coming with the update, but Aul called it “considerably better” than its predecessor. “Thousands of improvements have gone into code between the two builds,” he tweeted. When asked if the build was stable enough for daily use, Aul said that depends on a user’s tolerance for bugs, but that the build is the one he uses daily. People who don’t want to go through the hassle of downgrading and then re-upgrading will get brought along with the next build of Microsoft’s mobile operating system that the company releases publicly. According to Aul, the bug in 10136 that prevents upgrading from 10080 will be fixed in later builds, and people who have the current build installed will be able to jump up to the next version available. 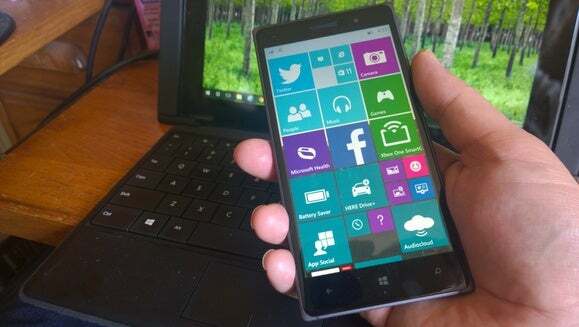 The continuing updates to Windows 10 Mobile are good news for people awaiting the consumer release of Microsoft’s mobile operating system. The company hasn’t provided a set release date for it yet, but has said that it won’t be available on July 29, when Windows 10 for desktop PCs and laptops will start shipping.